** All packages stated here are inclusive of entrance fee, workshop fee, activity fee, facilitator and fully air-conditioned transports unless otherwise stated. ** All prices are based on min participation of 40 students per bus with 4 complimentary teachers. Surcharge applies if minimum participant is not reached. Greater discount is negotiable for greater number of participants. 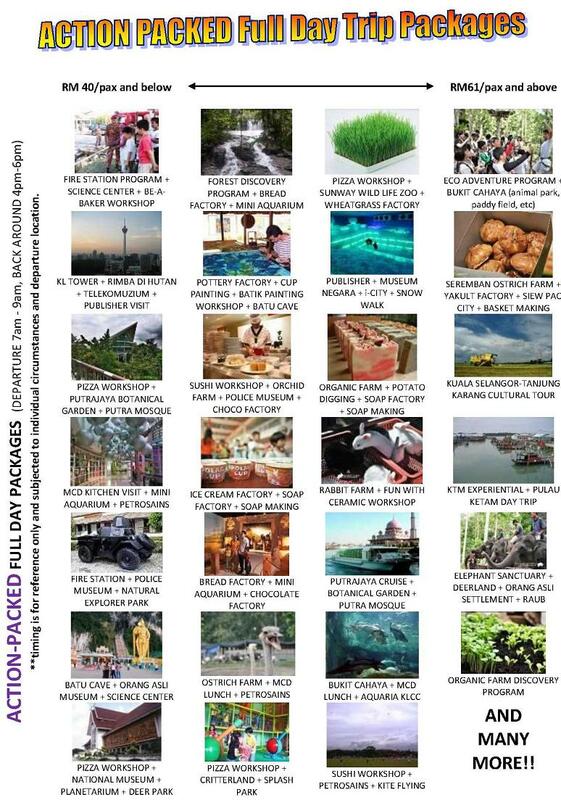 ** Prices are based on students of age 7 and below, departing from KL / PJ area. Price varies with departing location. **Prices valid for Malaysian only (with valid MyKad or MyKid). Additional charges applies for non-malaysian. ** Adult pricing (above 12) = additional RM5 – RM15. ** Destinations might be subjected to seasonality and might not be available on certain days and date. ** Brochure valid for trip date 1 July – 31 Dec 2011. ** We put in our best effort in providing the most accurate information. The company will not be liable for unintended errors in this brochure.